Located On Two Greg Norman-designed Championship Golf Courses And Surrounded By 15-Acres Of Family-friendly Recreation, This Resort Caters To The Golfer, The Businessperson And The Family. The Premiere Golf Club Features A Clubhouse, Restaurant And Banquet Facility, Which Can Accommodate Anything From Large Golf Tournaments To Evening Functions Or Corporate Events. The Omni Orlando Resort At Championsgate Also Features A Business Center, On-site Retail Shops And A Kids Program. The 730-Room Resort Has A European-style Spa, Which Offers Massage Packages, Body Wraps And Facials. It Has An 850-Foot Lazy River And A Full-service Health Club With 24 Hour Access. The Resort Has Five Unique On-site Restaurants, Each Specializing In A Specific Type Of Cuisine Including A Pan-Asian Style Restaurant, A Mediterranean-style Restaurant And A Poolside Bar And Grill. The Resort Also Offers Complimentary Shuttle Transportation To All Walt Disney World Theme Parks. The Resort Consists Of 730 Contemporary Guest Rooms And Suites And Two And Three Bedroom Designer Villas, Each With Complimentary High-speed Wireless Internet Access, An Executive Work Desk And Over-sized Modern Furnishings. Rooms Feature Fully Stocked Refreshment Centers, Easy Chairs, Plush Robes And In-room Safes. The Resort Also Offers “Get Fit” Guestrooms, Which Include A Portable Treadmill And Healthy Snacks In The Refreshment Center. Omni Orlando Resort at ChampionsGate – A Golf & Spa Resort Is The World Headquarters Of The David Leadbetter Golf Academy, An International Chain Of Golf Academies That Allow People To Take Private Lessons From Former Professional Golfers. 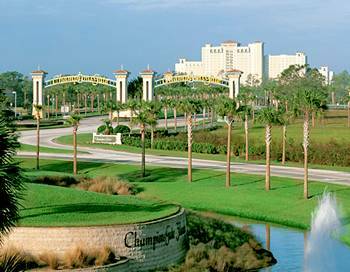 Click Here For A Special Deal At The Omni Orlando Resort at ChampionsGate – A Golf & Spa Resort!